ROWE RACING is on the right track with their preparations for the “Eifel marathon”. At the 42nd DMV 4-hour race at the Nürburgring, the second race in the VLN endurance championship, the team from St. Ingbert showed great improvement compared with the season opener at the Nordschleife two weeks earlier. A top 10 time in the practice session and a decent performance in the race were positive signs in the direction of the major highlight of the season: the 45th ADAC Zürich 24h race on 27th/28th May on the same track. Once again, issues with the tank system and unfortunate constellations with code 60 zones, in which the cars have to drive slowly in certain sections after accidents, for example, prevented a top 10 finish. 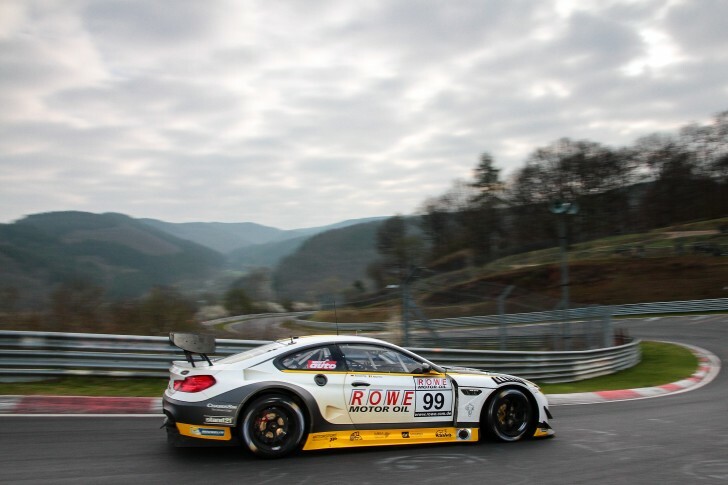 This saw BMW works drivers Philipp Eng from Austria and Finland’s Markus Palttala in the BMW M6 GT3 with #98, who were ninth in qualifying with a deficit of just 2.6 seconds, drop down into 17th place in the final standings. The crew in the sister car with #99 suffered even more bad luck; their race came to an early end about half way through. In the very first lap after the pit stop, during which BMW DTM driver Maxime Martin of Belgium handed over the wheel to new team member and Nordschleife expert Marc Basseng, shortly after the entrance from the Grand Prix track to the Nordschleife, in the Hatzenbach area, Basseng was involved in a collision with a slower vehicle through no fault of his own, which saw him smash through the barriers. Basseng was unscathed, but broken steering meant his race came to an early end. After three race weekends in a row, ROWE RACING now has a break over Easter and can recharge for the coming tasks.